As planned, the marketing group Lift met on April 26, 2018 to discuss the current marketing measures for the 'CANopen-Lift' standard. Brainstorming for a new demonstrator was also on the agenda of the meeting. On March 13, 2018, the members of the Special Interest Group Lift met in Nuremberg. At this meeting participants from 10 nations were present again. The focus was on expanding the standard with many new features, e.g. for condition monitoring, destination call systems and secure positioning systems. At the PlugFest of the SIG Lift on March 14, 2018, representatives of 23 companies also met 10 countries in Nuremberg to test the interoperability of their devices based on the CANopen-Lift standard. After a long time a meeting of the marketing group Lift took place once again. On January 30, 2018, representatives of 13 companies met in Nuremberg to discuss how to bring the 'CANopen-Lift' standard back into the focus of decision-makers. On January 29, 2018, the members of the Special Interest Group Lift met as part of TF IoT in Nuremberg. The meeting focused on the procedures and protocols for condition monitoring of lift components. On April 26, 2017 the members of the Special Interest Group Lift met in Nuremberg. Because of the many participants the meeting took place at City Hotel in Nuremberg. At this meeting participants from Denmark, Germany, Japan, France, Liechtenstein, P.R. China, Sweden, Switzerland, Spain and USA were present. On the 25th of April 2017, the 14th CANopen-Lift PlugFest took place. Host was once again the CiA in Nuremberg. But due to several interested participants, the PlugFest exceeded the capacities of the rooms provided by the CiA, so that it was necessary to rent rooms in the Ibis Nuremburg City hotel. On September 7, 2016 the members of the Special Interest Group Lift met in Nuremberg. At this meeting participants from Denmark, Germany, Japan, Liechtenstein, Sweden, Switzerland and USA were present. Main topic was the extension of the standard with various new functions, the proposal for the new virtual device Position Supervisor Unit and for a acceleration sensor. On the 6th of September 2016, the 13th CANopen-Lift PlugFest took place. Host was once again the CiA in Nuremberg. But due to several interested participants, the PlugFest exceeded the capacities of the rooms provided by the CiA, so that it was necessary to rent rooms in the Ibis Nuremburg City hotel. On the 4th of August, 2016, the companies Böhnke + Partners, Cedes, ELFIN, ELGO, Intec., Klinkhammer and Kollmorgen met to revise the definition of the new virtual device Position Supervisor Unit, which offers the possibility to safely evaluate the position and speed of lifts. On April 13th 2016 the member of the Special Interest Group Lift met in Nuremberg. At this meeting participated members from Czech Republic, Germany, Liechtenstein, Sweden, Switzerland and USA. On the 12th of April 2016, the members of Special Interest Group Lift met the 12th time to test the interoperability of their products in the CANopen-Lift PlugFest. Among the participants one could find this year four lift-controller manufacturers, one inverter manufacturer, three providers of display systems, one lift-panel manufacturer, a provider of emergency call systems and a manufacturer of position encoders. At the Interlift, CAN in Automation (CiA) exhibited its CANopen Lift demonstrator comprising some new products. Furthermore several companies pre-announced to support CiA 417. The Interlift 2015 in Augsburg, Germany has closed its doors. CiA was present as usual with its CANopen Lift demonstrator showing the interoperability of CiA 417 compliant devices. Of course, in a conservative industry the number of innovations is limited. The CAN Newsletter reported already in front of the biannually exhibition about some recently launched products. During the tradeshow additional exhibitors promised to support CANopen Lift in the near future. On the 8th of September 2015, the members of Special Interest Group Lift met the 11th time to test the interoperability of their products in the CANopen-Lift PlugFest. Safety electronics plays mare and more a key role also in the lift industry. Especially, since the normative demand for a system to recognize uncontrolled car movements with open doors these systems have spread among lifts. The members of the special interest group lift met for the 10th time to test their CANopen-Lift products’ interoperation on the 14th April, 2015. The great interest in this event and the short-term registration of some attendees led to quite cramped conditions in the present premises. In the year 2014 several users and manufacturers of CANopen-Lift components approached the company W+W Aufzugkomponenten to implement a standardised wiring of the products. This shall avoid wiring errors and reduce the mounting time. The meeting of the CANopen Marketing Group Lift took place on October 16, 2014 at the ELFIN GmbH in Cologne. On September 24, 2014 the members of the Special Interest Group Lift met in Nuremberg. At this meeting participants from Germany, France, Italy and Sweden were present. Main topic was the extension of the standard with various new functions. After the discussion of the application for the bootloader function, a discussion of new functions for the electronic lift guard, big TFT displays, the connection establishment of virtual consols and the tunneling of CAN data via TCP/IP networks followed. On September 23, 2014 the members of the Special Interest Group Lift met for the 9th PlugFest to test the interoperability of their products. Among the participants from Germany, France, Italy and Sweden were five manufacturers of control systems, two manufacturers of frequency inverters, two providers of indicator systems and a manufacturer of doors. Host of the PlugFest was the CiA in Nuremberg. On May 22, 2014 the companies BÖHNKE + PARTNER, ELFIN, ELGO, Intec and KLST met to define the extension of the open standard CANopen-Lift for the connection of a safety box with the lift. The meeting took place at BÖHNKE + PARTNER in Bergisch Gladbach (Germany). On April 9, 2014 the SIG Lift meeting took place in Nuremberg. For the first time participants from Italy were attending, the company GEFRAN, which is working on a CANopen-Lift port for converters now. After sighting the comments about the extention of the specification, the definition of the virtual devices for emergency calls and of security building parts for lifts were the main focus of the meeting. The manufacturer of lift components reviewed the interoperability of their CANopen-Lift products on April 8, 2014. Nine companies from Denmark, Germany, Italy and Sweden were attending the 8th PlugFest. Host was the CiA in Nuremberg. The lift component manufacturers tested their CANopen-Lift products’ interoperation on the 3rd of December, 2013. Nine companies from Denmark, Germany, France, Sweden and Spain travelled to Nuremberg for the 7th PlugFest. Host was the CiA. Modernization of two passenger lifts and four bed/transport lifts in the main building of Mora Hospital was necessary in order to enhance accessibility, reliability and energy efficiency. This modernization included conversion with new gearless machines, including controllers, control cabinets and sensors, new automatic lift doors and shaft doors, new finishes, control panels, etc. This article explains the concept of the virtual terminal interface defined in the CiA 417 Lift application profile. It also describes the motivation and needs of this interface and tries to promote the power and the benefits given, together with a summary of the functionalities and the implementation. Limax33 Safe consists of four components: a magnetic tape with absolute encoding, a presence detector for the magnetic tape, the Limax33 RED sensor for determining the absolute position of the elevator cabin, and the Safe Box, in which all switching and control functions are integrated. The encoded magnetic tape is simply installed freely hanging in the elevator shaft using a mounting kit. The integrated safety switch serves to detect the presence of the magnetic tape. The redundant, SIL-3-certified sensor determines the momentary absolute position of the elevator cabin through hall sensors, which scan the encoded magnetic tape contact- free. A wear-free plastic guiding guarantees that the correct distance between the sensor and the magnetic tape is maintained at all times. Schaefer offers, in cooperation with Böhnke + Partner, an access control system, which allows an inexpensive and reliable realization of demands in apartment/office buildings, banks, hotels, hospitals, etc. The employed RFID technology is distinguished by high-level data security and state-of-the-art security. The system consists of a reader unit, a lift controller with USB transponder reader, and of transponders. The communication as well as the control of the installation is realized via CANopen. On July 3 2013 the CANopen Special Interest Group Lift met in Nuremberg. At the beginning the results from PlugFest of the day before were discussed. In the coming months procedures to standardise the tests are to be worked out. The components manufacturer of the lifts the interoperability of their CANopen-Lift products on the 2nd of July of 2013. 10 participants from Denmark, Germany, France and Sweden took part on the sixth Plugfest, hosted by CiA in Nürnberg. CANopen for Lifts, specified in CiA 417, has reached a maturity that allows fast development cycles, short integration times and easy maintenance. This article shows the usage of model based development methods and hardware-in-the-loop (HIL) testing for lifts, following well-known schemes from automotive engineering and transforming them for lifts. This work is based upon the modeling of a lift system by Matlab/Simulink, which later will be used as a HIL test bench. The article discusses how conformity tests and integration tests can be conducted in the proposed environment. Furthermore a demonstrator lift is presented that takes advantage of the proposed ideas. In the CANopen application profile for lifts (CiA 417), the most essential devices with CAN bus connection for entire lift group are described. This has the advantage that the communication among units is standardized. Devices behave in the same manner, independent of the manufacturer. 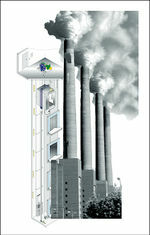 This can be illustrated particularly in the example of the load measuring device and its connection to the lift controller bp308, of Böhnke + Partner GmbH. On September 26 2012, one day after the fifth PlugFest, the Special Interest Group Lift met in Nuremberg. At the outset a procedure for documentation was discussed. The english Wiki was determined to be the central place for the description of new functions, until these are taken over into the specifications. Lifts consist of many components. Like in football, even having the best individual players is not a guarantee for success. Teamwork makes the difference. SafeLine makes teamwork visible. The PlugFest was an open event of the CiA, where the French company Sprinte took part for the first time. The PlugFest gave the participants the opportunity to link their products and to prove the interoperability of defined functions of the new standard version 2.1, in small changing teams. A meeting of the CANopen Marketing Group Lift took place at ELFIN GmbH offices on the 12th of September of 2012. The main topics at the meeting where the preparation of the upcoming Interlift 2013, the increase of CANopen-Lift demonstrators, press publications, the visualization of the functionalities on the internet and the development of the lift models at the Heilbronn University. The CANopen Marketing group Lift met on March the 6th 2012 at the Heilbronn University. After the voting for the substitute chairman of the Marketing Group Lift the main points of the meeting were the handling of the CANopen Lift Demonstrator and we discussed the events to show it. Another point was the discussion of an online demonstration of CANopen components on a website. ELFIN will check the technical solution and Masora would provide the location for the devices. On the 25th of April of 2012 took place in Nurnberg a meeting of the SIG Lift. The French company Sprinte, which produces and develops CANopen products since many years ago, participated for the first time. After a presentation from Jörg Hellmich about the current marketing activities, some new functions that should take the current stand of the normative a step further, in the future. On May 11th 2011 a meeting of the SIG Lift took place at CiA office Nuremberg. After a review of the last meeting and the comments to the new version 2.1 of the specification, there was a discussion on the submitted enhancments regarding a tunneling of messages for monitoring tools, virtual inputs for the detection of persons in the lift car and in front of the doors, new parameters for the drive unit, COB-IDs for tunneling the control messages in a group of lifts. In this CANopen Lift plug fest, CiA members performed several communication stress tests with their devices. The purpose of these devices are still capable to provide CANopen communication services without errors even at extreme bus conditions (up to full busload, up to maximal bus lenght). The CANopen SIG “Lift” released the version 2.0 of the CANopen application profile for lift control systems (CiA 417). The completely re-structured specification is partly incompatible to version 1.0. In particular, the specification for some of the virtual devices such as car drive has been revised significantly. Also some PDO specifications have been updated. In general, lifts are becoming more complex. An increasing number of electronic devices are installed in lift control systems so as to be able to satisfy both rising demands in regard to functionality and the requirements set forth in current standards and safety specifications. Embedded microprocessors respond to input signals or sensor data and thus generate output signals or messages, which are determined on the basis of algorithms written in the internal firmware. To make it possible for the electronic devices to work together and exchange internal information or commands they will have to be connected with each other by means of serial networks. Global energy consumption has to be significantly reduced. The ecological footprint of Europeans is too big. We live beyond our means and at the cost of others and future generations. A large share of the ecological footprint consists of burning fossil fuels and the emission of the greenhouse gas carbon dioxide for energy consumption. To achieve the goals of reduction in carbon dioxide emission defined in the Kyoto protocol international legal guidelines to reduce energy consumption were adopted. Some of them already affect the lift industry. The CANopen safety chip CSC, which was developed and overhauled by a consortium, is now available in a new version CSC02. The TÜV Rhineland Group technical standards authority has released the CANopen safety chip CSC02 for safety-oriented applications up to SIL 3 (safety integrity level) in accordance with IEC 61508 (test report 968/EL 215.02/09). Displays can do much more than showing numbers. They support other components of the CANopen bus with memory; they even perform as interface to passengers and service engineers. You probably know all about CANopen and its individual items. You know the benefits and its limits. And now you will learn about one device which appears rather minor in the beginning and will proof to be essential and beneficial for all other components in the end: The display. Any news so far? Technical systems are, in general, becoming ever more complex. Electronic systems – usually equipped with tiny embedded microprocessors – are implementing new functions, increasing convenience or improving system safety and reliability. Responding to signals made provided by sensors or arriving at inputs, these processors employ the algorithms written in the internal firmware to determine what the assembly actually does. The more information available about the system, the broader the basis upon which decisions can be made. The CANopen Lift demonstrator was jointly built by CiA members. The lift control prototype with real-life devices demonstrates the interoperability of CiA-417 compliant devices. Last year, the demonstrator was shown on the CiA booth at the Interlift exhibition in Augsburg (Germany). In addition, the demonstrator was exhibited at several German conferences as well as some company-specific events in the Netherlands and Sweden. The modular system has been designed and manufactured by the Swiss company Masora. The CiA-417 specification defines the messages (CAN-ID and content) and all the process data in detail. The configuration parameter for drives, car doors, and I/O panels are defined in detail in CiA-417, too. The CANopen Lift specification has been reviewed entirely and was released as version 2.0 in February 2010. But some prototypes already have been shown at the Interlift 2009. The operability of CANopen Lift products is tested by means of plug-fests organized by CiA. March saw the first PlugFest in Nuremberg and Heilbronn, as members of the CANopen-Lift group proved the interoperability of their devices. Two controller manufacturers (Böhnke + Partner and Weber Lifttechnik) and several suppliers of lift components (Elgo, Masora, Posital, Schaefer and Ziehl-Abegg) exchanged data via the CANopen network. As expected, some minor differences in the interpretation of the CANopen-Lift specification (CiA-417) were detected. In October, the world's largest fair about elevators took place. 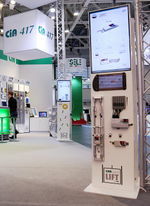 CiA presented "CANopen Lift" on its booth. Within the four days of the fair many questions of visitors were answered and information brochures were distributed. Our member companies had the chance to meet and discuss with the CiA secretary, who is responsible for the success of the CANopen Lift specification. Precise positioning of the lift cabin is a vital precondition for optimized travel of the elevator. The formerly applied magnet switches with their rather big efforts in installation nowadays are more and more replaced by encoder systems. Encoders for monitoring position and speed allow any required curve of way and time. Whereas incremental encoders are perfect for measuring speed, absolute encoders are designed to fit positioning applications. Doors are closing. The synthetic voice in the lift becomes silent. The electronic devices controlling the lift start to communicate inaudibly for human beings before the lift moves the passenger to the requested floors. In the past, the embedded lift control system used proprietary networks and device interfaces. This lead either to high efforts in system integration or the lift manufacturer had to buy all electronic devices from one single manufacturer. CAN in lift control application has been used for many years by major lift manufacturing companies. In 2002 several medium-size companies decided to move to a standard higher layer protocol based on CAN. They decided to use CANopen as a basis for this standard. The goal was to have some kind of plug and play lift control system for any standard lift application. The result of the standardization work is the CANopen application profile for lift control systems CiA-417. By use of this standard it is possible to build in maximum a lift application with 254 floors and eight parallel lifts. Control Techniques has introduced the Unidrive SP that can be stopped in a controlled, damage-freeway - and given them the means, for example, to bring lifts safely to the nearest floor for the evacuation of their occupants. This is due to the drive’s power supply input. This feature is relevant for any equipment that needs UPS back-up - e.g. fair­ground rides and machine tools, so that it can be shut­down safely. Lift control applications increasingly use decentralized and distributed control systems. These control systems require communication networks that link the sub-controllers, the “intelligent” sensors and the actuators. The level of compatibility is an important issue, if you want to buy and use off-the-shelf products. At the southern end of Hamburg stand the remains of the St. Nikolai church. The gothic style church was built in the 19th century and was an architectural masterpiece of its time. It is one of the few remaining landmarks from prewar Hamburg and after heavy raids by Allied forces in 1943 it was virtually the only structure left standing in the city center. The church was left blackened with soot and partially destroyed; the ruins were left standing in order to serve as a memorial to the victims of persecution in the Third Reich. The third highest church tower in Germany spirals up to an impressive 147 m height. Lift operating panels include control devices and display modules. The customer has to connect them with large effort via numerous parallel wires. A fast and easy installation of the operating panels is often impossible. Solutions and concepts for a direct bus connection of lift operating panels have been discussed for a long time. Partial solutions have been achieved by the definition of a standard connector assignment for the connection of car operating panels. Switches and cam rails are fragile components. Mechanically fastening and adjusting them is time-consuming, moreover, adapting them to specific applications often requires many parallel switches and therefore many control inputs. However, there is a simpler and less troublesome solution: In lift technology, for instance, a position measuring system based on absolute rotary encoders can be used. Transportation feeds on energy. As an increasing number of people live in cities, more energy is needed for transporting them around. In the last century, the urban population has grown from 15% to 50% of the entire world population. This figure is expected to increase to 70% by the end of this century. According to research published by the United Nations, skyscrapers can lower transportation costs since less energy is used to transport people. The Interlift fair in Augsburg showed us once again that the trend in the lift industry is moving towards networking components by using standard Bus systems. So, most of today’s firms offer their component parts with a CAN or LON connection. Parallel to hardware interface compatibility there were first talks at the fair about standardising protocols on the CAN Bus basis to enable the interconnection of components from various manufacturers to make up a complete lift system.